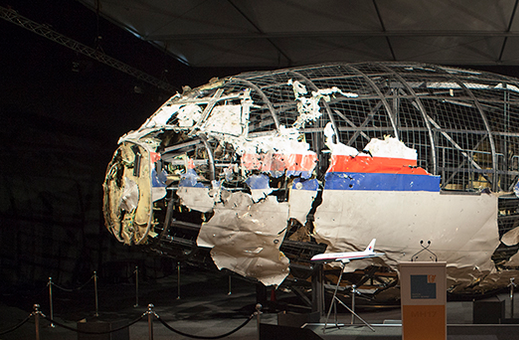 A reconstruction of the wreckage of MH17 by the Dutch Safety Board. Russian president Vladimir Putin has gone on the attack against the investigation into the shooting down of Flight MH17, accusing the international joint investigation team of partiality. In an interview broadcast on Austrian television, Putin suggested that the absence of Russian experts in the inquiry meant that his country’s point of view was not properly represented. ‘All arguments need to be taken into consideration, including Russia’s,’ he said. ‘Justice can only be done if Russian researchers are allowed to take part. Last week Dutch foreign minister Stef Blok stepped up the pressure on Russia to take responsibility for the disaster, after the JIT presented comprehensive evidence showing that the missile which brought down the plane was fired from a mobile launcher transported from the Russian military base in Kursk. Australia and the Netherlands have formally held Russia liable for the act of shooting down the Malaysia Airlines plane as it flew over the disputed territory of eastern Ukraine in July 2014. All 298 people on board were killed, including 196 Dutch nationals. Russia has steadfastly denied any involvement.